Dead Space 2 was released today and that means it's time to announce Dead Space 2: Severed, the first DLC release for the Xbox 360 and PlayStation 3 that will bring back the lead characters from Dead Space: Extraction. A prequel to the original Dead Space, Dead Space: Extraction was a Wii-exclusive rail shooter that's been ported for release as part of the PlayStation 3 version of Dead Space 2. It tells the unpleasant tale of a group of people attempting to escape the horror of Aegis VII, only to find that things aren't all that terribly much better aboard the ISS Ishimura. After being shot down on approach, they discover that the ship is infested with hideous, twisted necromorphs and find themselves trapped in a desperate battle for survival. The first DLC release will see two of those characters, Gabe Weller and Lexine Murdock, return for an adventure that runs "parallel" to that of Isaac Clarke's in Dead Space 2. This time around, players will take on the role of Gabe, now employed as a security guard on the Sprawl, who must battle an onslaught of necromorphs in a desperate effort to get himself and Lexine to safety. Dead Space 2: Severed is "coming soon" on the Xbox Live Marketplace and PlayStation Network, but there's no word yet whether it will be released for the PC. 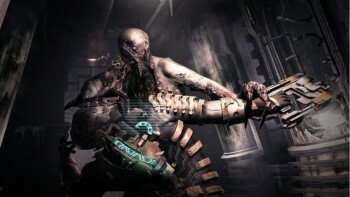 Dead Space 2 is out now for the Xbox 360, PlayStation 3 and, yes, PC. UPDATE: An Electronic Arts representative has confirmed that Dead Space: Severed will not be released for the PC.